To Stephen J. Mangan (aka Kwaw) at Aeclectic’s tarotforum we owe two recent finds on the early history of fortune-telling with playing cards. I include one here (the other soon) with his blessings. More and more references are turning up as google puts old books that are out-of-copyright on the web. 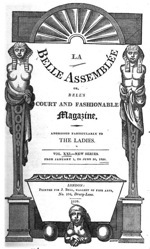 This 1820 description of a revealing card reading was published as part of an excerpt, titled “Confidential Servants” from a French work, Les Jeunes Femmes, of M. Bouilly, as published in Belle Assemblee: Or, Court and Fashionable Magazine.